The following presentations were featured in the Pathways Alignment strand hosted by E3 Alliance at the P16 Texas Prospect Summit on November 1, 2017 in Dallas, Texas. The Impact of Dual Credit Coursework on Postsecondary Success session features key findings of several recently published statewide studies, including the impact of taking college-level coursework during high school on postsecondary outcomes. Research presentations include a landscaping of dual credit course-taking patterns over time and degree completion. Of particular importance is understanding the impact of dual credit at 2- and 4-year institutions. Participants will engage in table conversation to determine implications for both community college and 4-year institutions and identify opportunities to expand dual credit course taking. Four years ago the State passed House Bill 5, radically transforming high school graduation requirements with a new focus and priority of building strong career-based pathways. Today, districts across the state are partnering with local colleges to build new and innovative career pathways aligned with workforce needs. The Building Strong Career Pathways session features regional efforts to cultivate Career and Technical Education programs of study aligned with college and regional workforce needs. Presenters also offer a state and national policy perspective and the State’s strategic priorities for advancing CTE. In 2015 the American Association of Community Colleges launched a national project focused on building capacity for community colleges to design and implement structured academic and career pathways at scale, for all of their students. 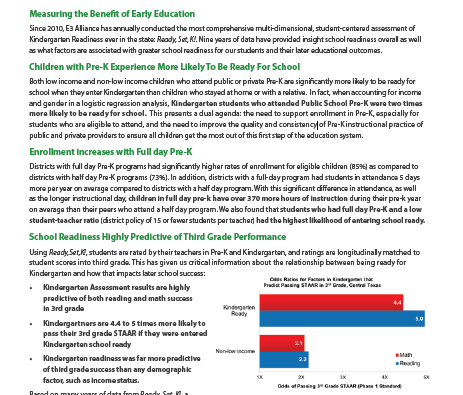 The Texas Success Center has taken on the task of adapting this model for implementation in Texas to dramatically contribute to the state’s strategic plan of increasing credentialed young Texans to 60% by 2030. This session will highlight the research supporting the pathways approach to improving student success and the early implementation experiences of Texas institutions involved in this national project as well as the Texas Pathways Project.